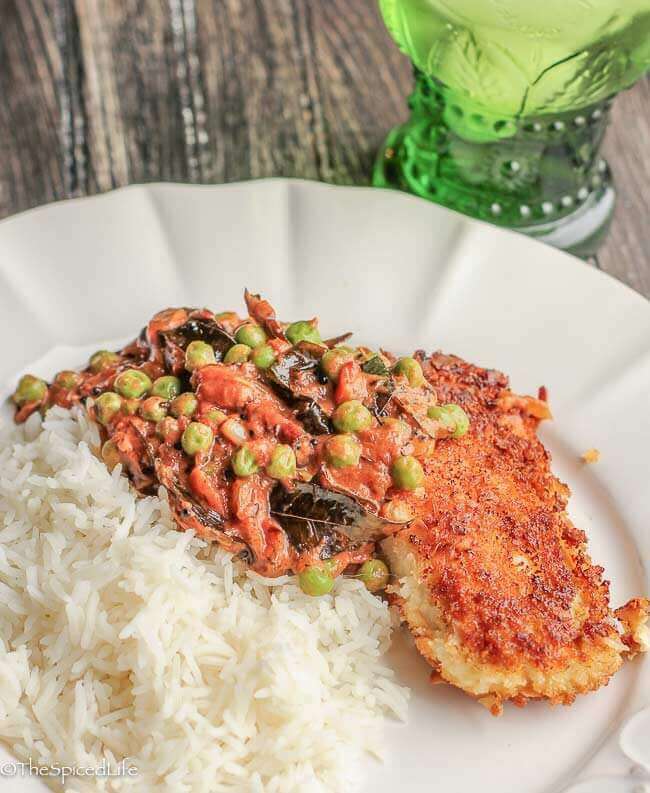 Coconut Crusted Mahi Mahi with Masala Peas is a “clean out the pantry” Indian-inspired meal that hit it out of the ballpark–everyone loved this crispy, creamy, delicious dish! The mandate to use up everything in the freezer(s) continues, and the culprits that led to this meal were frozen tomatoes from last season, frozen curry leaves, frozen peas and frozen fish. As a matter of fact this entire meal was conceived around the idea of using up stuff in the freezer. Living where I do, I tend to keep a very well stocked pantry, including 2 freezers, and I am becoming concerned I may not be able to use up everything before we move. It doesn’t help that we leave for a two week beach vacation soon (planned long before all of this moving craziness happened), and so cooking in general is not at the top of my to-do list. I centered the meal around fish, and decided I did not want to braise the fish, as I wanted a pan-fried fish with a crispy exterior. I used mahi mahi because it is the most expensive of the fish in my freezer, but any flaky white fleshed fish would work. Because I did not want to braise the fish, I did not want to make a stew or sauce with the fish in it. So instead I focused on making a very intense sauce to be served separately. This meal turned out fantastically. 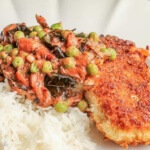 It is essentially a fish curry, but by cooking the curry and fish separately, the fish retains a great crispiness and adds a toasted coconut flavor to the dish. All of us adored it. Unlike most of my dishes, this one takes 3 pots, so plan accordingly. It is not difficult or complicated though, so do not be put off by the 3 pots. Place the chopped tomatoes in a steep and deep sauté pan with a pinch of salt. Bring to a boil and then reduce the heat to low to simmer out the extra liquid. Let it simmer gently while you prepare the rest of the dish. Heat the coconut oil and vegetable oil over medium high heat in a medium sauté pan. Add the cinnamon stick. When it starts to unfurl, add the mustard seeds and partially cover the pan. When the seeds slow in their popping, add the cumin seeds. Let roast briefly, about 30 seconds, until fragrant. Add the curry leaves to the whole spices--be careful because they will sputter. Stir and let them roast for another minute. Add the chopped onion with a pinch of salt. Cook, stirring, until caramelized, 15-20 minutes. At some point they will start to stick or scorch, in which case deglaze with as much white wine vinegar as needed. Add the ginger and garlic. Stir and cook for another 5 minutes. Add the garam masala. At this point, add the onion mixture into the pot with the tomatoes. Keep the temperature on low and turn to preparing the fish. Whisk the egg and water together in a wide, flat bowl and set aside. Whisk the panko crumbs and coconut flakes together with a pinch of salt. Heat the coconut oil in a large nonstick skillet over medium heat. Because my fish are frozen, I always press them with paper towels first to remove excess moisture. Dredge the fish filets in the starch of choice (I like potato starch) and then dredge them in the egg mixture. Then immediately dredge them in the panko/coconut mixture. Place them in the pre-heated nonstick skillet. Cook until golden and crispy on each side, and until the flesh flakes apart when pierced. 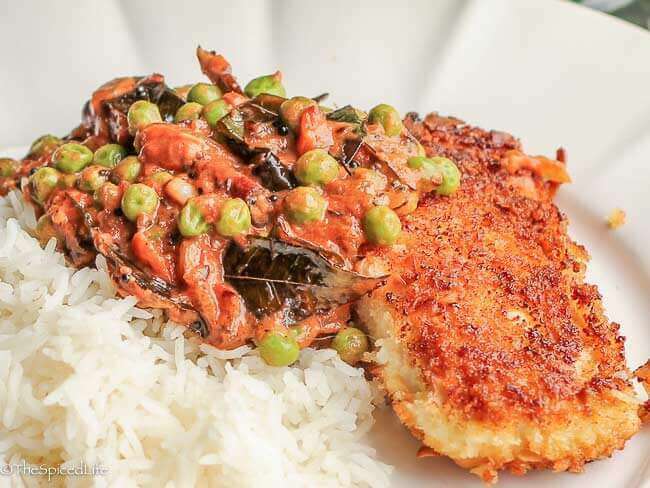 When the fish are cooked, add the peas and coconut milk to the tomatoes. Stir until heated through and taste for salt. Serve the tomato and peas with the prepared fish. We liked Basmati rice on the side. What an incredible combination of flavours and textures! This looks amazing! 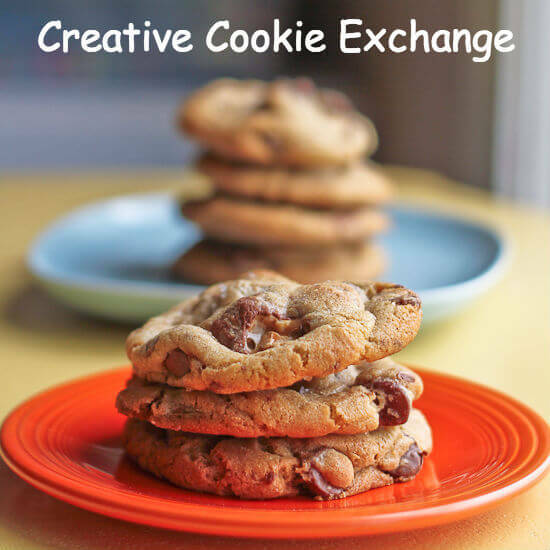 Oh wow, this looks SO incredibly delicious. 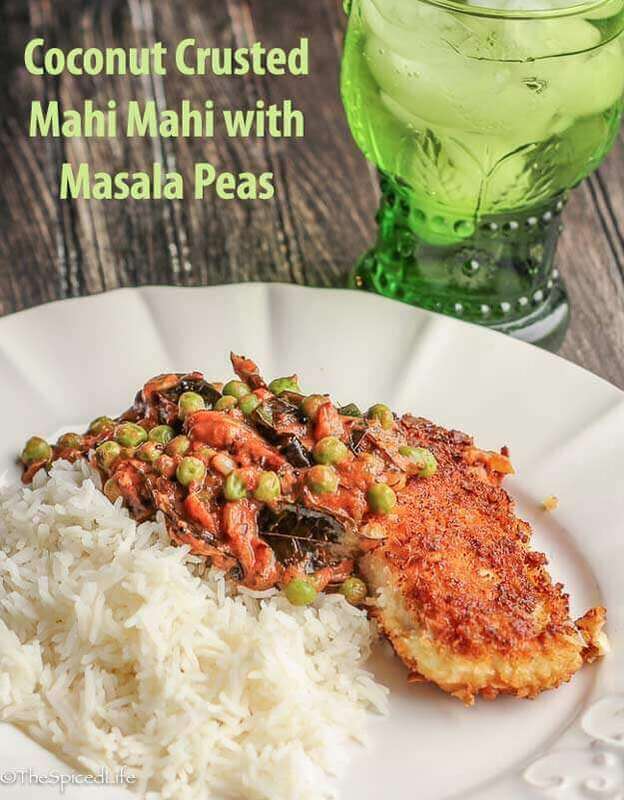 I have a soft spot for all things Indian food and the masala peas look totally up my alley.